Established in 2006 High Supplies has been cultivating a love for cannabis culture as well as cannabis seeds. We offer over 50 different varieties of marijuana seeds. All of the Cannabis seeds that you can buy in our online shop possess a first-class genetic disposition. Moreover, our Dutch cultivator has refined and enhanced existing breeds. The key advantage being even higher yields of highly effective Cannabis. 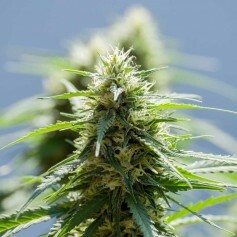 High Supplies Cannabis seeds are cultivated in the Netherlands. They are hybrids from the breeds Sativa, Indica and Ruderalis. Our Cannabis seed shop is divided into different categories. You can directly search for a breed suited for either indoor or outdoor cultivation or opt for feminized seeds, which, being true to their name, have been modified to grow only female plants. Of course we also offer traditional seeds that develop both male and female plants. Besides to buying seeds, you can also purchase a complete set of accessories allowing for immediate dissemination. Buy Marijuana Seeds | Buy the Best Marijuana Seeds Online - High Supplies Find the best marijuana seeds online. Only the best quality autoflowering, feminized and other cannabis seeds. Available from € 15 + fast and discrete shipping.